The oldest mosque within the borders of Turkey is the Ulu Cami (Great Mosque) of Diyarbakir, dating back to the seventh century with several later restorations. Other early great mosques are in Urfa, Cizre, Silvan, Mardin, Kiziltepe, Bitlis, Harput, Niksar, and Kayseri. Probably the most important Seljuk work is the Old Mosque in Konya, dating back to 1155. For several centuries, the Seljuk mosques were of the basilica type with the Great Mosque of Divrigi providing a superb example. The style then transitioned from square volume to circular ones like a dome, squinches or bands of triangles. Later Ottoman Turks introduced more sweeping innovations but also used elements traditionally used in Asia, such as the squinch, more frequently than everybody else. Two important innovations to the development of Ottoman architecture from this period are kulliye (the social/religious complex) planned around the mosque and the adoption of half-dome as a major structural element for building Great Mosques. Both concepts were introduced by the complex of Fatih in Istanbul, between 1462 and 1470. The complex of Fatih consisted of a mosque, sixteen madrasahs (Koran schools), a library, a hospital (Dar us Sifa), a hostel, a public kitchen (imaret), a caravan saray, and the mausolea of Fatih Mehmet and his wife. His son Beyazit II continued in this tradition and built three complexes (Istanbul, Edirne, and Amasya). The biggest one in Edirne, built in 1484-1488, contained a mosque, two hospices, a large public kitchen, a dining hall, bakery, storehouse for food, a medical school, a hospital, a mental asylum, among other facilities. Even a more grand and magnificent example of Ottoman architecture was yet to come however. The Suleymaniye, in Istanbul, designed and built by Architect Sinan (Koca Mimar Sinan) in only seven years starting in 1550, is the biggest and most complex masterpiece of its type. 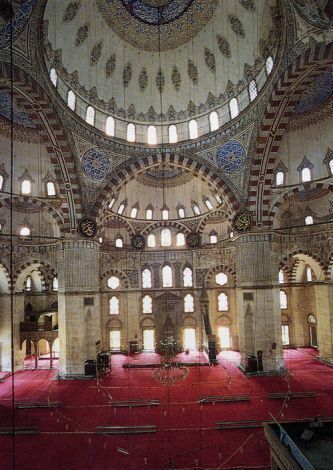 Sinan dominated his century with several hundreds of large and impressive masterpieces such as Selimiye Mosque in Edirne with its massive 31.5m diameter dome.